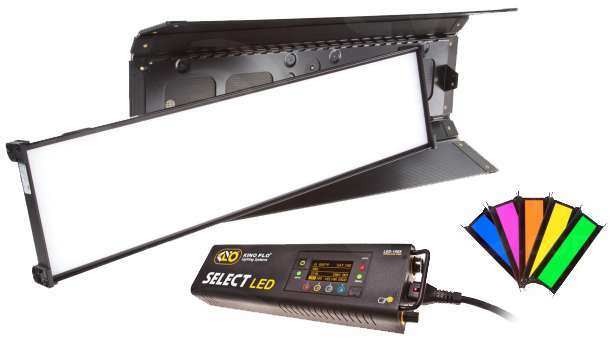 We believe that The Kino Flo Select Freestyle 31 is a game changer in LED lighting. This light features revolutionary colour matching and offers three colour channels. The ‘gel channel’ gives you a huge range of colour options including blue and green screen and exact matching to 100 well known gels. You’ll save time on set and money on consumables. No plastic gels to throw away also means a saving for the environment. This is one of the reasons we are so excited to add the Kino Flo Select Freestyle 31 to our #newgreenkit. As you’d expect from Kino Flo, the light is both robust and flexible. Remove the LED panel from the plastic housing and use the extra mating plate to fix it to a stand. That gives you a lighter, easy-to-use lighting fixture for a small space. They run off battery or mains power. 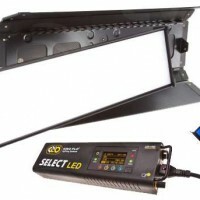 The light is fully adjustable via a DMX controller. If you need to change the colour on the move go ahead you won’t lose light intensity. And if you want to dim the light you can do so without loss of colour. Once you know the kelvin settings you want, use the preset buttons to store them for later. We almost don’t need to mention the exact Kelvin settings, the flicker free, quiet operation and the low energy draw. These are things that you’ve come to expect from Kino Flo. So the Kino Flo Select Freestyle 31 has also these features and a lot more. 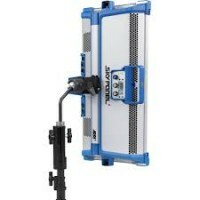 The kit includes an eggcrate, mounting plate, 25m extension lead and DMX controller. Just add a set of Vlok batteries and one of our stands, and you’re ready to go. Kino Flo Select Freestyle 31 Downloads. Quick bit of maths please: required Please check your adding up. Total of 9 + 6 please. Quick bit of maths please: required Please check your adding up. Total of 2 + 10 please. Quick bit of maths please: required Please check your adding up. Total of 6 + 8 please. thanks for forwarding on information about the Kino Flo Select Freestyle 31.